What do Bill Clinton, Miley Cyrus, Johnny Cash, and Elizabeth Warren all have in common? Answer: All of them have claimed to be part Cherokee, but none have been able to prove it. Not that any of these celebrities are unique in this regard. Rare is the Oklahoma family that doesn’t think it possesses at least one-sixteenth Cherokee blood. But here’s a fun fact: according to the Cherokee Nation, there are approximately 120,000 tribal members living in the state, which has a population of 3.8 million people. That’s only about 3 percent of Oklahomans. The tribe we’re going to visit, however, is bigger than the Cherokee Nation and perhaps even bigger than the entire state of Oklahoma—although that’s difficult confirm, since the Census Bureau doesn’t keep statistics on this subset of the population. We are among the tribe of the Wannabes: non-Native Americans who insist on claiming Indian heritage. Why do Wannabes appropriate, fabricate, and invent a Native identity? Is it for pure financial gain? Is it part of a colonialist project to speak for the Other? College admissions? A highly subjective existential crisis? Examining the motives of the Wannabes is a fraught subject, one where good intentions rub up against old racist habits and where narrative embroidery easily morphs into self-delusion. It’s where the personal is political and politics get personal. If you watched TV at any time in the 1970s, you’ll remember the Crying Indian. He debuted on television on Earth Day, 1971, in an event some people have called the birth of the modern environmental movement. The ad, produced by the pro-bono advertising group the Ad Council, is one of the most emotionally powerful one-minute spots ever produced. It begins with a vague image of a man in a canoe barely visible through the leaves of a tree. He paddles gently down a river to a slow thud of drums. The fringe from his buckskin jacket, two braids of long hair, and a single feather in his headband come into view. We briefly glimpse the idyllic image of unspoiled America: pine trees, a glistening lake, and a Noble Savage in a canoe. Here is the natural man as Jean-Jacques Rousseau once imagined him: the human being at one with nature and freed from the shackles of societal conventions. Now we are face-to-face with our stoic warrior. He paddles with more vigor as the tempo of the music picks up. The camera zooms in on two pieces of garbage in the water. A brassy soundtrack starts to blare, and the camera sweeps out to reveal a factory belching smoke into the air and more litter in the lake. Our Noble Savage drags his canoe to a shoreline littered with plastic cups and aluminum cans, his head bowed in sorrow. He walks to a road filled with traffic, his once-stoic face now showing signs of a profound sadness as he watches garbage being tossed out of passing cars. An off-screen baritone narrator intones the following: “Some people have a deep, abiding respect for the natural beauty that was once this country. And some people don’t.” A plastic sack dropped by a motorist explodes at our Wise Elder’s feet, his buckskin now soiled by fast food. The narrator pauses a beat, allowing a sense of collective shame to wash over the audience. The narrator starts back in again. “People start pollution, and people can stop it.” A single tear wells up and then rolls down the Indian’s cheek as the screen fades to black. Many people have wondered about this tragic figure, and in his 1982 memoir, Iron Eyes: My Life as a Hollywood Indian, Cody purported to give a full account of his life. He tells us he was born and raised on a ranch in Oklahoma to family of Creek and Cherokee farmers, only finding fame years later as a character actor and consultant on Indian dress and sign language to famous directors such as Cecil B. DeMille and John Ford. Iron Eyes traced his ancestry all the way back to the Trail of Tears. During the Civil War, his Cherokee grandfather joined up with a bunch of Confederate outlaws known as Quantrill’s Raiders. This mixed-race posse terrorized Missouri, Kansas, and Indian Territory, pillaging Union forces and riding off into the Ozarks with their loot. They were indomitable, submitting neither to the Confederate military brass nor to the victorious Union army. They were, in effect, professional badasses—some wearing black sombreros with silver inlays and bullet bandoliers across their chests. Among their posse was a black man named Two Bits who acquired the name for his piano-playing in whorehouses. If this is starting to sound like a Sam Peckinpah or Quentin Tarantino Western, remember that Iron Eyes’ memoir is subtitled: My Life as a Hollywood Indian. But Iron Eyes, well, according to his memoir, was just a regular old “Injun” who “wandered off the reservation into fame and fortune.” The fact there were no Indian reservations in Oklahoma and that the eastern portion of the state—which included the Cherokee area—was known not as Oklahoma Territory (as Iron Eyes calls it) but Indian Territory, and that statehood occurred when he was just two years old, might raise a red flag among literal-minded readers. But for the sake of our journey, let’s give him a pass. We’ll assume he is speaking metaphorically of “the reservation.” In any case, the narrative quickly shifts from an undisclosed location on an Oklahoma ranch to Hollywood, as Iron Eyes recounts a lifetime of work during the Golden Age of the Hollywood Western, and it is here we see the formation of the iconic American Indian take shape. Iron Eyes also taught actors a few rudimentary Plains Indian sign language gestures. Cherokees are not Plains Indians, but somehow Iron Eyes established himself as an authority on the subject. Some tribes have different gestures, but Iron Eyes created a fusion, an Esperanto of hand talk. In 1970, he documented this language in a book called Indian Talk: Hand Signals of the American Indians. The book was reviewed positively by one of the most prestigious scholarly journals in anthropology, American Anthropologist, in 1972. 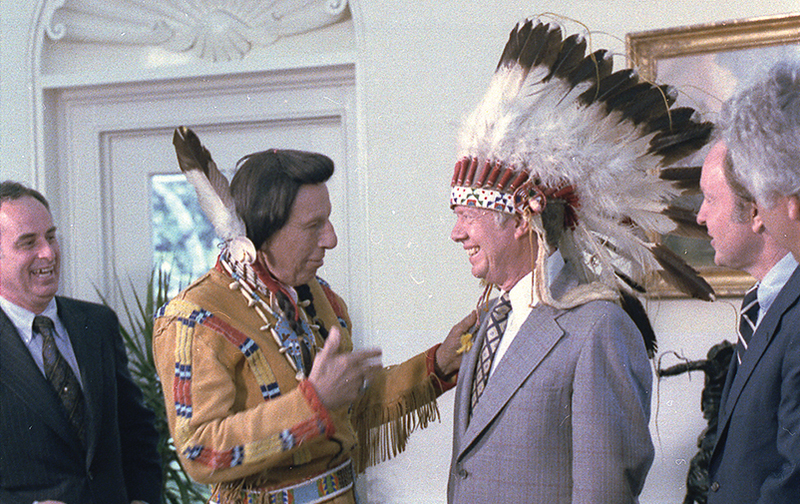 As Hollywood moved from the era of pure spectacle and illusion to a politicized and realistic aesthetic in the late 1960s, Iron Eyes followed suit. Working with the mercurial British actor Richard Harris on the 1970 A Man Called Horse, Cody began to insist on authentic portrayals of initiation rites and medicine rituals, often over the demands of the producer. Although Iron Eyes played bit parts in dozens of Westerns over five decades, it is this film that may hold the clue to his transformation from a supporting actor into America’s most recognizable Indian. A Man Called Horse tells the story of an English aristocrat, John Morgan, who is captured by the Sioux and enslaved by them until his cunning and dogged determination wins the Natives over and he becomes a Sioux warrior. Unlike previous Westerns, however, A Man Called Horse spared the Armenian bole (a reddish-brown chemical often sprayed on white actors to make them look Native) and convinced many moviegoers that they were finally catching a glimpse of authentic Plains Indian culture. Churchill’s critique hinged on a strident defense that “authenticity” is something that can only be defined from within a given culture. Churchill, like Iron Eyes Cody, claimed part Cherokee ancestry, and set about defining the parameters of Indian authenticity in books like Fantasies of the Master Race. Churchill himself, however, turned out to be more parts Wannabe than Cherokee. By the early 1970s, then, Iron Eyes Cody was not only simply a Native American character actor, but one of the most important figures in fashioning Americans’ ideas about the “authentic Indian.” The culmination of his long career was undoubtedly the “The Crying Indian.” The Ad Council, a pro-bono conglomeration of companies that creates public service announcements, sponsored the commercial. Rosie the Riveter, Smokey Bear, “Just Say No”: all public service announcements produced by the Ad Council. During the Cold War, the Ad Council turned to blatant U.S. propaganda, urging Americans to take an active role in promoting U.S. industry in the fight against communism. At the same time, the modern environmental movement was born and urged industry to promote recycling and reuse of materials. The Ad Council countered with its own “environmental” message, which stressed the responsibility of individuals—not corporations—to fight pollution. One of the taglines of this Keep America Beautiful campaign was “People start pollution. People can stop it,” which seemed benign enough, but turned out to be part of a political attack on more progressive environmental groups such as the Sierra Club. Keep America Beautiful was a non-profit group supported by bottle manufacturers to prevent bottle deposit laws, and encouraging more and more consumption, according to investigative journalist Ginger Strand. Bottle deposit laws—most enacted with the birth of the environmental movement—were driving down demand for new glass and aluminum. The Ad Council’s “Crying Indian” spots tried to change the conversation, making the environmental movement a question of personal ethics, not corporate responsibility. Iron Eyes initially declined the role as the Crying Indian. He didn’t know how to swim and was afraid to be out in a canoe in San Francisco Bay by himself. The director promised to have a helicopter hover over him in case he tipped over. When it came time for the money shot—the tear rolling down the cheek—Iron Eyes was ready. He knew how to cry on demand for the camera, but there was a problem: His real tears did not show up well enough on camera. The director used glycerin to created one large tear that rolled down Iron Eyes’s cheek at the last minute. In 1996, the journalist Angela Aleiss revealed that the man known to the world as “The Crying Indian” was born Espera Oscar de Corti in the small town of Kaplan, Louisana. Aleiss told me it was an open secret among Native American actors in Los Angeles that Iron Eyes wasn’t Indian, but no one had thought to figure out who he really was. Aleiss consulted records from a small Catholic church in the town and found that de Corti’s father, Antonio, had been the victim of vicious anti-Italian sentiment in turn-of-the-century Louisiana. The decade before Oscar’s father came over from Sicily, more than a dozen Italians in the state had been lynched. To make matters worse, an extortion racket commonly referred to as the Black Hand Society (an early version of the Mafia) had sprung up in southern Louisiana. Antonio de Corti had to give up his small shop and flee to Texas, where his three sons eventually joined him. Somewhere along the way, young Oscar de Corti saw a Wild West show and became enamored with all things Native, always playing the Indian in Cowboys and Indians. Aleiss wrote that the de Corti family remade themselves in Texas; the father slightly Anglicized his name to Tony Corti. Oscar made his way to Los Angeles in the teens, becoming Oscar Codey and finally Iron Eyes Cody. By the time Aleiss interviewed him in 1996, he had been widowed by his Native wife and brought up the two sons they adopted from a Navajo reservation. When he died in 1999, everything indicated that he convinced himself of his own lie. Iron Eyes Cody may have been a Hollywood Indian, but there’s more to the tribe than show business. And then there’s Aunt Bee, who told Liz Warren that her papaw had inherited high cheekbones from his Indian ancestors but did not pass them down to the little girl. It’s all part of a home-spun narrative of authentic Americana: Daddy worked hard as a janitor, but had a heart attack and couldn’t pay the medical bills. Mama was devoted to her family, but sometimes didn’t have enough money to put food on the table for the four kids. Eventually, little Liz had to work, too, before she dropped out of college at age 19 to support her husband’s professional goals. Then she picked herself up by her bootstraps and put herself through law school in the wake of a divorce. It’s like a PG-rated Loretta Lynn or Tammy Wynette song with all the cheating and drinking purged from the storylines. We still are left with a nagging question for the Wannabes: Why do they do it? Why do so many white people—from Elizabeth Warren to Miley Cyrus to Iron Eyes Cody—fashion a Native identity out of thin air? I contacted Aleiss about her research to ask her if there was anything that united this unruly tribe. The one common denominator she cited was “financial opportunity.” Indeed, there are many instances of whites making a buck while trafficking in faux-Native identity, but I’m not totally convinced it all boils down to money. According to the 2010 census, more than a quarter of Native Americans live in poverty, contrasted to only 10 percent of whites. There’s more money to be made in the white world than on the reservation. I suspect that the claim of Native identity bestows upon a prospective author a sort of symbolic capital that works in inverse proportion to white privilege. Fake Indian personae have allowed otherwise un-publishable white authors to achieve notoriety. There are many examples, including Forrest Carter, the author of The Education of Little Tree. Carter turned out to not be Cherokee, as he claimed, but a former Ku Klux Klansman from Alabama named Asa Earl Carter. The case of Carter’s memoir is laden with even more ironic twists and turns than that of Iron Eyes Cody, as Carter made a name for himself in the public sphere by becoming one of Alabama’s most vocal white supremacists. He is reputed to have written Alabama Governor George Wallace’s cri de guerre: “Segregation now, segregation tomorrow, and segregation forever.” Carter disappeared from public life only to remake himself years later as Forrest “Little Tree” Carter, an orphaned boy raised by his Cherokee grandparents, wise elders who taught the boy to live a simple, natural life until he confronts the racist system of an Indian residential school. Perhaps racial hypocrisy explains the extreme case of Asa Earl Carter, but there’s undoubtedly something strange in the American psyche regarding the Wannabes, and I haven’t been immune from their truth-y allure. I owe my rather unusual middle name—St. Clair—to a notable Choctaw artist named St. Clair Homer, a man I once understood to be my maternal grandfather. As a boy, I hated my middle name. Who would name their boy St. Clair? “Isn’t that a girl’s name?” I asked my mom one day. My mom told me I should be proud of the name because St. Clair Homer was a famous artist and somehow (I wasn’t quite sure how) a part of our family. Homer is known to the art world as Homma (the Choctaw work “homa” which means “red”—as in “Oklahoma”). Let’s get this straight: Homma was no Wannabe. He traced a lineage back to Pushmataha, a general who fought the British in the War of 1812; his grandfather had been Secretary of the Choctaw Nation. The thing was, I wasn’t quite sure if Homma was actually my grandfather because my grandmother started living with another man who wasn’t Native at all. When I was three years old, though, Homma won first place in the Oklahoma Bicentennial Indian Art Exhibition at Gilcrease Museum for a bronze sculpture called “Spirit Horse.” I was too young to remember the exhibit, but I saw it later during school field trips. What struck me about Homma’s work was its stark defiance of much of the art in Gilcrease. He engaged in a playful mocking of Western mythology. There was none of the rugged individualism of the American West: the white cowboy facing down the harsh environment and the Indian savages. In 1976, for the centennial of the Battle of Little Big Horn, Homma declared that he was going on “full war-path mode” and made a series satirical postcards “commemorating” the event. In the meantime, I had learned the truth of my connection to Homma. My biological grandfather had died shortly after my mother was born during World War II. Homma and my grandmother lived together off and on for decades, and he practically raised my mom. Later, they drifted apart and my grandmother remarried. His presence in my life was still there, however, especially every time anyone asked me about my middle name. My first year of college, I met a group of exchange students from Great Britain. I told them I was from Oklahoma, a place they only knew from the musical and Westerns. “You must be part Indian or something,” one of the Brits said. I thought about this for a minute. Yes, I must be part Indian. Not only am I named after one, I’m darker than most white people. The British exchange students really seemed interested. They clearly wanted to know an Indian. There, I’d done it. I felt good to be part Indian, as if I belonged to something big. Something noble, wise, and timeless. Now that I’d said it, it had to be true. After all, my mother’s family came from rural eastern Oklahoma, right on the dividing line between the Choctaw and Cherokee Nations. The family’s cemetery plot in Checotah was right next to the Indian section. And, like Liz Warren’s Papaw, we had high cheekbones. So I would belong to the tribe of the Wannabes for a while, especially during my early 20s, when I actually didn’t know what the hell I was. The tribe gave me a sense of identity and it carried some instant prestige when traveling abroad. Europeans love Indians, I discovered. I never fully bought in, however. I knew plenty of people who tried to cash-in on some supposed Indian great-grandfather to qualify for a tuition break or minority status. That wasn’t me. Originally published by This Land Press, August 2014. Cody and Perry 1982: 194-195. Churchill continually cautioned readers that Wannabe or “Friends of the Indian”—such as the Richard Harris character—are almost always neocolonialist wolves in sheep’s clothing. The best white people could do, in his opinion, was to sit back and listen deeply to real Indians such as himself. In 2005, Churchill began to be hoisted on his own petard. Following academic misconduct allegations, the Cherokee Nation retreated from Churchill, saying that he only possessed “associate membership” as an honor, and that all associated memberships were rescinded in the 1990s. Like Elizabeth Warren, Churchill refused to back down, and presented evidence that may identify him as one-sixteenth Cherokee.